A rich variety of water-activated and pressure-sensitive tapes and tape dispensers of all types for all applications, so that our customers can take advantage, where appropriate, of one of the fastest, most flexible and easiest to use methods for securing cartons and many other applications. Adhesive transfer tapes are used for mounting, holding, joining and splicing paper, wood, glass and painted surfaces in normal and severe environmental conditions. Cloth tapes are used for packaging, patching, sealing, holding parts together, color-coding objects, splicing objects together, strengthening seams on objects like carpets, connecting heating, ventilation and air-conditioning ducts, and asbestos abatement. 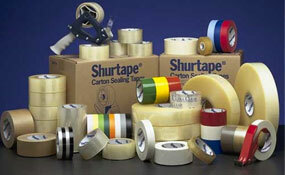 Double faced tape is utilized for mounting, holding, splicing and fastening objects on various substrates. Film packaging tapes can be used with hand or automatic dispensers to seal, repair and bundle corrugated cartons, paper or film containers. Paper tapes can be used for masking in painting, bundling and splicing. Strapping tapes are used for holding packages together or bundling where high tensile strength is needed. Tape dispensers, which exist in almost as many varieties as tapes, make the use of tapes more efficient, especially in industrial applications where speed is required in high-volume production operations. Water-activated tapes work better than pressure-sensitive tapes in dusty environments. Dust will adhere to the adhesive of pressure-sensitive tapes, reducing their ability to stick to a carton. By contrast, the wet adhesive of water-activated tapes will actually bond with the fibers of a corrugated carton. When using water-activated tapes, make sure the tape is wet enough. Failure to apply the proper amount of water will compromise the performance of water-activated tapes. Too little water will not allow the adhesive to penetrate the corrugated box fibers, making the bond less than secure. Too much water will reduce the adhesion. Special care has to be taken in choosing the right tape with the right adhesive for a particular application. Too often, users select tapes with adhesives that either strip paint or paper when the tape is removed, or that leave unwelcome residues on some surfaces. Pressure-sensitive tape should be stored in its original packaging in a cool, dry area, away from direct sunlight and should be used within 12 months of the date of shipment. Water-activated tapes are available in test weights from 35 lbs. to 60 lbs., widths from 1 ½ to 3 inches, and lengths from 375 feet to 600 feet in rolls. Kraft-paper varieties can be strengthened with fiberglass and polypropylene yarns and, and they can also be plain, colored and printed. Pressure-sensitive tapes come in widths from ½ to 6 inches, and lengths up to 1,500 yards on rolls. Varieties can also be strengthened with fiberglass, polypropylene and polyvinyl chloride yarns and lamination, and they can also be plain, colored and printed.